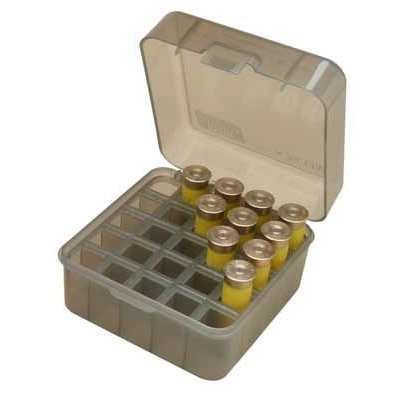 The S25-12M holds 25 shotshells in the down position. The latch has been designed to be opened easily, even with gloves. Has a mechanical hinge. The 10 gauge shells fit tight and will loosen up after a few uses. Can also be used to organize some brands of 12 gauge choke tubes with a maximum lenght of 3.1". Great for 10ga and 12ga 3.5 rounds, and brilliant service also. Bought to store old collection of paper cartridges does the job.